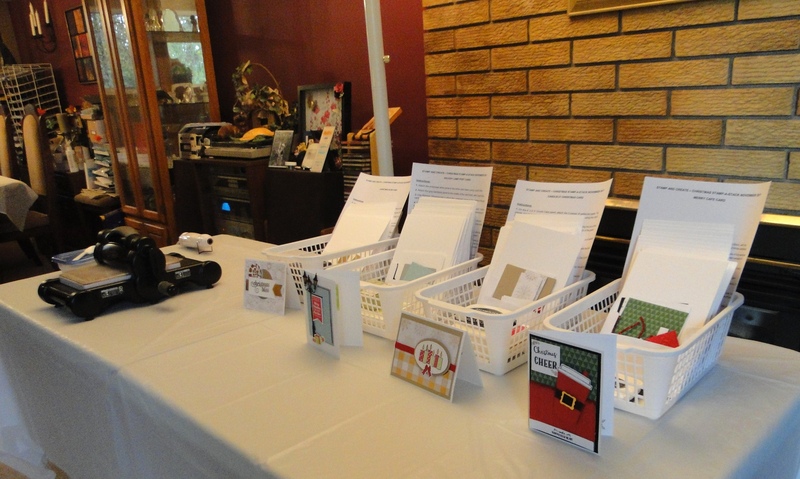 This is an annual event for me and my customers; everyone looks forward to getting together for a fun social event, and making a dent in their Christmas card list. Everyone made 8 cards; 2 each of 4 designs. You can see that for the most part, 2 people worked on 1 card design at a time. They would take the whole basket, which has all the kits, stamp sets, inks, etc. in it, to the table, and get to work. 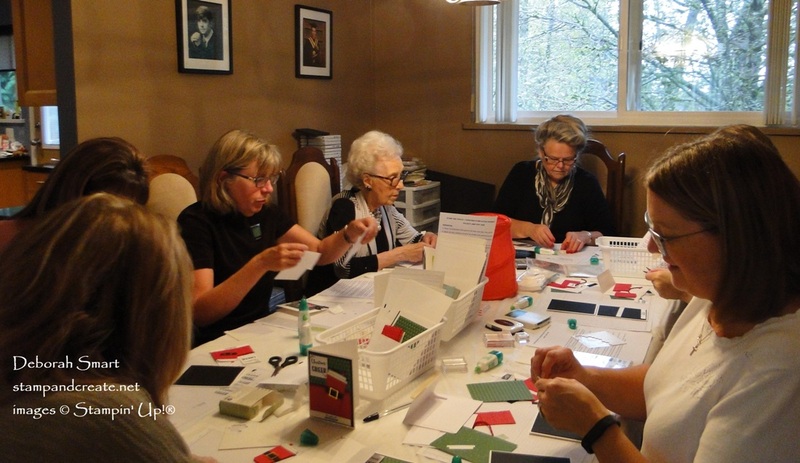 It takes some concentration to assemble the cards properly (even though written instructions are provided, not everyone actively reads them!) 🙂 Everyone did a great job with their cards. 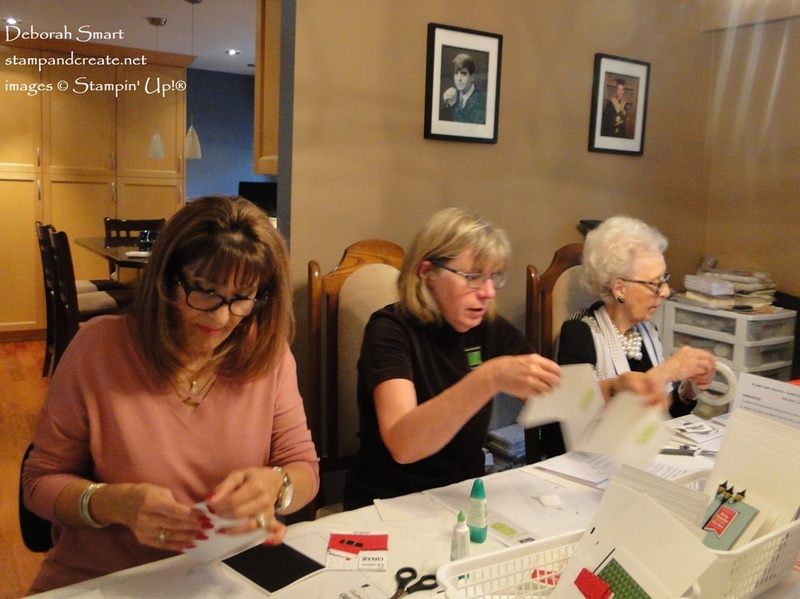 One of the stampers (Anna, on the far left) is brand new to stamping, and you would not have known it! She has natural talent 🙂 But she made sure to have me take pictures of her with her phone, while she was creating, so she could prove to her family that she did, indeed, make her own cards! While everyone was working, I had Christmas music playing on the stereo, to keep things festive! At one point, the song ‘Little Drummer Boy’ came on, and I joked that it seemed that everyone was stamping to the beat! As I mentioned earlier, I had the card kits put into baskets, so everything was ‘self contained’ for each design. Each person would take 1 envelope from the basket. That envelope contained all the cardstock and die cuts that they needed to create their 2 cards. The basket also holds the written instructions, ink pads, punches, dies, etc. – anything else that was needed to complete the cards. Here’s a look at the table; you’ll notice I have my Big Shot, Heat Tool and embossing powder container there, too. I had a small display on my coffee table, as well. I had to show off the Color Me Happy Kit, with the stamp set and the Stampin’ Blends markers. 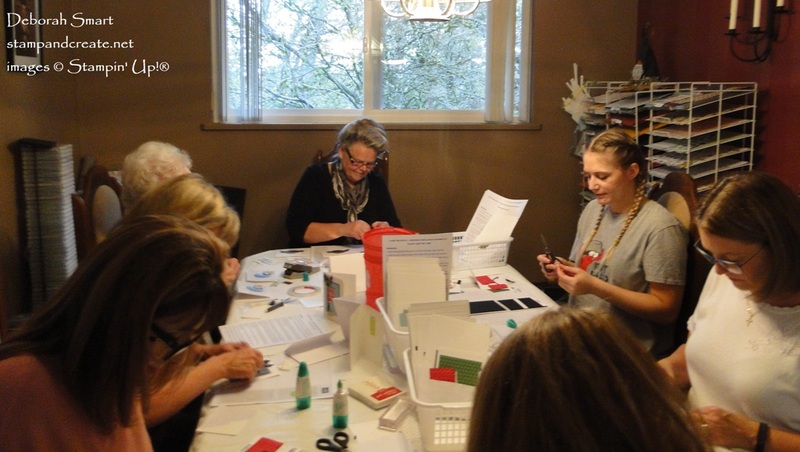 Everyone loved the colours, the beautiful cards & luxe envelopes that are included in the kit. I also had information about my Blends Club that starts in January (and a few ladies have already signed up!). Also, I shared about my 3 ways to get the Blends, and of course the Online Extravaganza that’s happening now. You can read about my Blends Club and my special offers for purchasing the Blends IN THIS POST. You can join whether you live close to me, or long distance (as long as you’re within Canada). Remember – the Online Extravaganza happens all week, until Nov. 26th – and I’m offering FREE SHIPPING within Canada on all orders over $50! Use Host Code FXDASWQU, and once your order has been shipped, I’ll refund by e-transfer your total shipping cost! That’s a minimum of $9.95 savings; more, if you order over $100. To read more about the sale, you can check out THIS POST. For my American readers – you can get in on the Free Shipping, too! Read the details in the post on getting free shipping from my friend and fellow demo Susan Horr, who lives in the U.S. She & I have joined forces to bring our Canadian and American subscribers/readers free shipping during this awesome sale! Come back again tomorrow, after you’ve shopped, to see some pictures of the cards that were created at the Stamp A Stack Weekend! Until then, you can click on either my signature below, or CLICK HERE to shop in my online store. The Free Shipping isn’t limited only to sale items – you can get free shipping from my on ANY Stampin’ Up! items currently available – with orders of $50 or more! Previous Previous post: It’s Happening Today! Looks like a fun weekend! I wish I lived closer. I would come! Deb, looks like a wonderfully organized, successful event. Congratulations on this wonderful event!